Magician Wanted: Exclusive Copa Club has an opening for prominent headlining magic act for the World Famous Copa Club floor show. Tryouts to commence this Monday. Competition expected to be fierce, so any trick that is is failed to be performed correctly will result in immediate dismissal. Object: Play cards from your hand to perform the magic MOVES required to complete a magic TRICK. All cards played to complete a Trick are collected. Player with the most collected cards wins. The Cards: Each card has two different components. 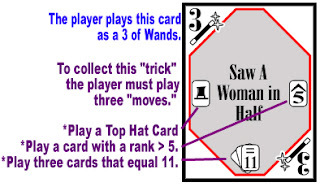 When played out of a player’s hand, the suit and rank of the card as indicated in the corner is used. Ranks are 1-10, and the suits are Wands/Top Hats/Stars/Smoke. When played as a Trick to be completed, the center area is used, which shows the Trick Name, and up to four Moves which need to be completed to collect the Trick. The first player is decided randomly, and turns progress to the player's left. If the player fails to perform all the Moves on a Trick, the player is removed from the game. If the player completes all of the Moves on the Trick, the player takes all of those cards played, plus the Trick card and places them in his completion pile. He then announces if his “Act Is Over” or if he’s “Going For An Encore”. In either case, the player flips up the top card of the deck to reveal a new Trick. If his “Act Is Over” the next player can draw one card, or attempt the new Trick. If the current player is “Going For An Encore,” the player MUST attempt this new Trick. 2) Draw Cards. If a player does not wish to attempt a Trick, the player can draw cards into his hand. If the previous player Attempted a Trick, the current player draws one card. Otherwise, the current player draws the amount of cards the previous player drew plus one more card. (So, the first player would draw 1 card, the second player draws 2 cards, the next player draws 3 cards, etc, until someone decides to Attempt a Trick, at which point, the "counter is reset" to 1). All cards drawn are hidden from the other players. There is no limit to how may cards a player may hold. The game ends when only one player is left due to the other player's being eliminated from failed tricks, or when the draw deck is exhausted.